Super Savings Item! 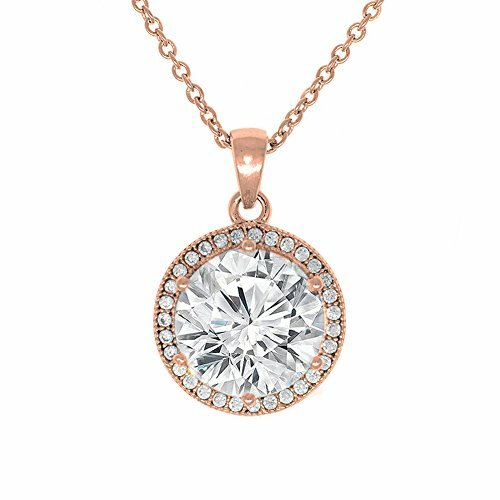 Save 38% on the Cate & Chloe Mariah 18k Rose Gold Plated Round Cut CZ Halo Pendant Necklace - Cubic Zirconia Halo Cluster Rose Gold Necklace w/Solitaire Round Cut Crystal - Wedding Anniversary Jewelry - MSRP - 150 by Cate & Chloe at SCRHI. MPN: CCGM10105NK. Hurry! Limited time offer. Offer valid only while supplies last. HIGH QUALITY LUXURY DESIGNER NECKLACE A soft, charming circle shaped pendant surrounded in 18k white gold to complete any evening or date look. A soft, charming circle shaped pendant surrounded in 18k white gold to complete any evening or date look. Easily breathtaking and adds instant sophistication to your evening wardrobe!! GIFT IDEAS FOR HER - Women, Ladies, Girls, Teens, Children, Wife, Mom, Daughter, Girlfriend, Her, wedding gifts ideas, girlfriend gift ideas, last minute gift ideas, bridal shower gift ideas, birthday gift ideas, teacher gift ideas, college gift ideas, teen gift ideas, engagement gift ideas, anniversary gift ideas, wife gift ideas, graduation gift ideas, or any gift for her. SHOP WITH CONFIDENCE - This is sold by Cate and Chloe, a leader in quality designer jewelry. Shop our entire collection which includes jewelry, necklaces, earrings, rings, bracelets, and other fine jewelry and accessories. Cate and Chloe strives to provide the highest level of quality, craftsmanship, and timeless designs that you can flaunt from the office to the red carpet. SATISFACTION GUARANTEE - WE OFFER 100% MONEY-BACK GUARANTEE, NO HASSEL RETURNS, and FREE SHIPPING ON EVERY ORDER. Get the best prices, deal of the day, discounts, deals, sales, on clearance on the most popular jewelry trending online. HALO SETTING - A soft, charming circle shaped pendant surrounded in 18k white gold to complete any evening or date look. Easily breathtaking and adds instant sophistication to your evening wardrobe! FASHION NECKLACE FOR WOMEN - We know you are hoping to impress the girl you have been dating for a while with new jewelry. This simulated diamond pendant will be the perfect addition to any womens jewelry collection with its gold plating & cz stones! If you have any questions about this product by Cate & Chloe, contact us by completing and submitting the form below. If you are looking for a specif part number, please include it with your message.